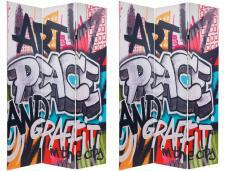 Double sided art print room dividers, with durable stretched poly-cotton canvas. Lightweight, portable, attractive, and functional. Decorate with "kids" art themes from famous children's book illustrations and literature. We added some cool entertainment prints to this category featuring famous cartoon characters like Dora the Explorer, Sponge Bob, Spiderman, Superman, The Simpsons and more! All art print room dividers folding screens measure 15 3/4"W x 70 7/8"H for each panel. Please note, if you are purchasing a 3 panel screen and want it to be free standing, it is recommended to purchase the stand. Recommended also for nursery schools, day cares and Sunday schools.